Published reports say President Obama has issued a presidential authorization allowing secret U.S. support for the Libyan rebels. Just what activities are authorized is murky, but covert action has long been a favorite tool of U.S. presidents. 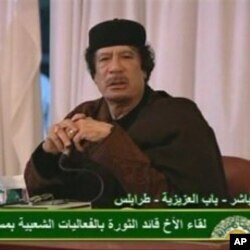 President Barack Obama has repeatedly made it clear Libyan leader Moammar Gadhafi should go. The United States is considering a range of options to bring to bear on the Libyan leader. One of them might be a covert program to topple him. In a time of international crisis, a U.S. president has several tools from which he can choose to affect events, ranging from diplomacy to military action. But somewhere in between is covert action. Covert action is any U.S. government effort to change the economic, military, or political situation overseas in a hidden way. Covert action can encompass many things, including propaganda, electoral manipulation, funding, arming and training insurgents, and even encouraging a coup.It is not clear what actions the CIA is taking or has been authorized to take in Libya. But the situation there is chaotic, with a ragtag rebel army in retreat from Colonel Gadhafi’s forces. Georgetown University Visiting Professor of Security Studies Jennifer Sims is a specialist in intelligence affairs. She says covert action should not be undertaken without a clear picture of who you are supporting and what the outcome will or should be. "You need to be very cautious about using this tool," said Sims. "It is not just one you do when you cannot figure out anything else to do. It is one that you need to engage in very carefully." As Sims points out, covert actions are tempting tools for a president to use. "The upside is that you can get outcomes that are ripe for getting with a minimum use, ideally, of force," she said. "And by keeping the U.S. hand hidden, you can hopefully get it without getting blowback on the United States in terms of public outcry over the outcomes that might make others unhappy. The downside, of course, is exactly what the upside is, that you are hiding the U.S. hand and if it gets exposed you can get blowback worse than you were ever going to get on the overt side." Covert actions traditionally have been carried out by the Central Intelligence Agency. Charles Allen, who served more than 40 years at the CIA, says proposals for covert action originate not from spies, but policymakers. The CIA, he says, is merely an instrument. "The Central Intelligence Agency rarely suggests this," said Allen. "This usually comes, and almost invariably comes, from the president and his senior policymakers; secretary of state, secretary of defense, or the National Security Council. Under some presidents, they have been very limited. Under others, where the threat was viewed as higher, covert actions are more often used." Intelligence professionals consider covert operations to be different than clandestine operations, which are more traditional espionage and counterintelligence activities. The difference is not merely one of terminology, but of law. In 1975, U.S. plots to assassinate foreign leaders came to light. The glare of the public spotlight led to strict rules on covert action, including requiring presidential approval of covert actions, known as a “finding,” and notification of eight key Congress members responsible for intelligence oversight. Clandestine operations have no such requirement for presidential authorization. Some covert operations, such as the Bay of Pigs invasion of Cuba in 1961, were disasters. Others, such as backing the mujahedin in Afghanistan in the 1980s against Soviet occupation, have been more widely viewed as successful.